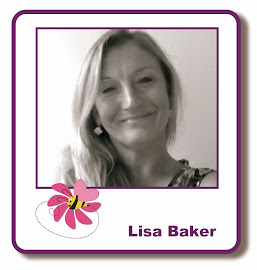 Welcome to Lisa.B.Designs : Butterflies and Sparkle - a Perfect Combination! Good morning all! Martina here with a bright and sparkly post this week, using some old favourites of mine. It's a quick post too, as tomorrow is class day with Lisa B and I am getting prepared...if you like pretty then it is certainly the class for you! My first step was to cut a piece of card to the size I needed for my card blank. Using Cracked Pistachio and Milled Lavender Distress Ink I created a blended background. 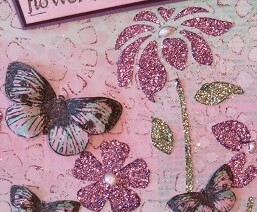 Using the same set I stamped some of the butterflies onto some more card with Black Memento Ink. I coloured the petals with the same Distress Inks as before and cut out. I also cut into the wings and shaped with an embossing tool to give dimension. Here, once again, I apologise. I seem to be losing my marbles lately and forgetting to photograph some of the stages while I'm making things. I think I get a bit lost when I'm playing! I wanted the Mosaic Sun Stencil detail to pop a little more in the background, so I replaced it on the card and used some Lavender Sparkle Medium with Cut and Dry Foam to foil over it all. I only used a small amount, as I did not want to flood the topper. Using the Imagination Modern Flowers Stencil, I then added some flowers across the page using Lavender and Sage Green Sparkle Medium. The final details were some words from the Artistic Stamper Set Botanical Plate 3 Set (again at 46% off! ), some Perfect Pearls and of course, my 3D butterflies! Quite a quick and simple card, but one for a person who likes sparkle I think. She is taking the mobile shop to the Barton's Point Model Flying Spectacular - admission FREE - this Saturday & Sunday, July 8 and 9. She'll be demoing on both days, so if you fancy a fun family day out, that's the place to be! Thank you for reading and I hope to see some of you tomorrow at class!